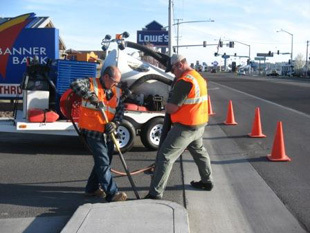 SUE Solutions, Inc. staff members provided ITD District 4, utility engineering design services for the reconstruction of US-93 (Blue Lakes Boulevard) from Falls Avenue to Poleline Road in Twin Falls City, Idaho. A critical service which was instrumental in the success of this project was SUE Solutions utility coordination services. SUE Solutions established early and continuous coordination with seven separate utility owners, allowing for an efficient process to complete the project. SUE Solutions performed Quality Level ‘A’ locating (potholing) at over 150 locations throughout the project corridor, and documented the findings on customized field data sheets. This data was then used to produce comprehensive utility mapping which was directly integrated into the project’s design plans. Though Quality Level ‘B’ designating was not part of the initial Scope of Work, SUE Solutions took the initiative and performed Quality Level ‘B’ task related services due to the inaccurate markings placed by the local locating entities. 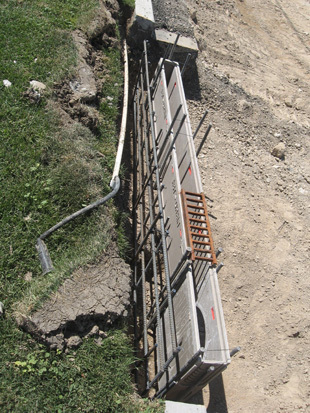 SUE Solutions investigated the utilities further through the use of their electromagnetic designating equipment, to ensure that the proposed pothole locations were accurate in correlation to the horizontal utility location, thus making sure that the project was completed on time and within budget. The SUE data collected, in conjunction with the mapping, allowed the design Consultant to come up with an innovative storm drain design. This ultimately saved the Idaho Transportation Department over $1 million by not having to relocate existing potable water facilities located at critical locations throughout the corridor.